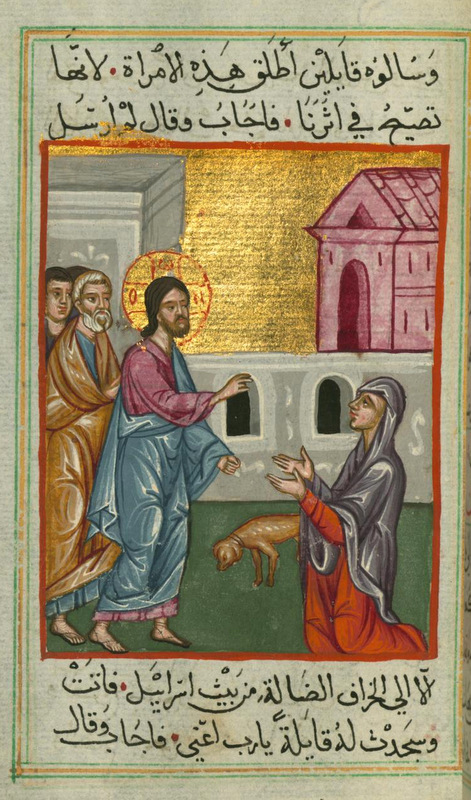 The theme of crossing hostile boundaries found in the story of the foreign woman Jesus is similar to that in Babe, a delightful story in which a little pig crosses many boundaries to bring hostile animals together. Ed McNulty, Visual Parables. Preaching Helps (Pentecost +11). Rev. Dawn Chesser, United Methodist Church General Board of Discipleship, 2017. The Adventurous Lectionary, Bruce Epperly, Living a Holy Adventure, 201t. Evangelectionary for August 17, 2014, Jonathan Shively, Evangelism Connections, 2017. "Reconcile," Kathryn Matthews Huey, Sermon Seeds, SAMUEL, UCC, 2014. "The Gospel Is Going to the Dogs," D. Mark Davis, Left Behind and Loving It, 2014. The Lectionary Lab, Pentecost 9, the Rev'ds Dr. John Fairless and Delmer Chilton (aka "Two Bubbas and a Bible"), 2011. Jesus Now, Proper (Ordinary) 20A, lectionary, study and worship resources from Faith Futures Jesus Then & Now. Rumors, for August 17, 2008, Ralph Milton, "Sermon helps for preachers with a sense of humor." Sermon Brainwave Special Edition, Responding to Charlottesville, 2017. "Give me your tired, your poor, those you consider dogs," Luke A. Powery, The Christian Century, 2017. "Learning How to Preach Again," Karoline Lewis, Working Preacher, 2017. "Jesus is Woke; We Should Be Too," Jacqui Lewis, ON Scripture, 2017. "Send Her Away!" Dan Clendenin, Journey with Jesus, 2017. "Blind Privilege and the Kingdom of Heaven," Andrew Prior, 2017. "Holy Surprise: Great Faith and the Canaanite Woman," Janet H. Hunt, Dancing with the Word, 2017. "Your Words Defile You, Jesus Said," Nancy Rockwell, 2017. Exegesis, Dr. Terrance Callan, Mount St Mary's Seminary, 2017. "'Getting' Great Faith," Karoline Lewis, Dear Working Preacher, 2014. "What the Canaanite Woman Teaches," David Lose, ...in the Meantime, 2014. "A Crumby Gospel," Sharron R. Blezard, Stewardship of Life, ELCA, 2014. 2011. "There's No Problem Bigger than God," Alyce M. McKenzie, Edgy Exegesis, 2014. 2011. "Jesus: the Canaanite Woman," Peter Lockhart, A Different Heresy, 2014. 2011. "Leftovers for all!" Christopher Burkett, PreacherRhetorica, 2014. The Painted Prayerbook, "Stubborn Blessing," Jan Richardson, 2014. 2011. Use of images. "Have Mercy," Suzanne Guthrie, At the Edge of the Enclosure, 2014. "A Place at the Table," Andrew King, A Poetic Kind of Place, 2014. "Listening for God's Love: What I Did This Summer," Dan Clendenin, Journey with Jesus, 2014. 2011. 2008. "A Mother's Cry," Janet H. Hunt, Dancing with the Word, 2014. "Modern Christian Legacy!" Thomas Beam, 2014. "An Important Word to Learn," Steve Goodier, Life Support System, 2014. "All Are Welcome," David Lose, Dear Working Preacher, 2011. Lectionary Blogging, August 14, 2011, John Petty, Progressive Involvement, 2011. "Faith Like a Dog's Breakfast," Peter Woods, I am Listening, 2011. 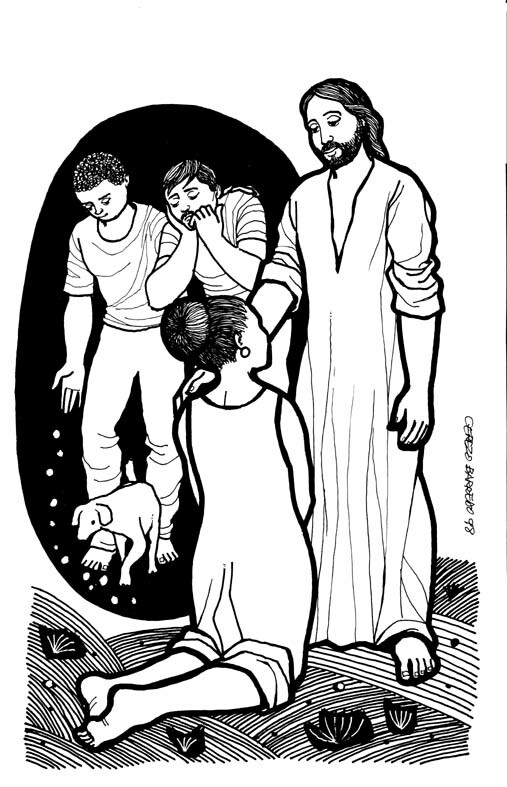 "Reunited," Miriam's Tambourine, reflection, artwork, worship resources from Memphis Theological Seminary. Liberal Lectionary Resources, Proper 15A, Brian Jackson, 2011. "Good and Pleasant," Linda Fabian Pepe, Theological Stew, 2011. "Love Wins," Bob Cornwall, Ponderings on a Faith Journey, 2011. "Make Your Years Count," Neil Chappell, a weird thing, 2011. "Compromise?," Melissa Bane Sevier, Contemplative Viewfinder, 2011. Sermon Notes for August 14, Michael Rich, In-Formatio, 2011. Dylan's Lectionary Blog, Proper 15. Biblical Scholar Sarah Dylan Breuer looks at readings for the coming Sunday in the lectionary of the Episcopal Church, 2005. The Saturday Night Theologian, Exegesis of Word and World, Tod O.L. Mundo, Progressive Theology Weblog, 2008. 2005. "Jesus on Vacation," by Jim Somerville. A Sermon for Every Sunday. Video sermons from America’s best preachers for every Sunday of the Liturgical Year. "The Table Scrap Feast," Rev. Cuttino Alexander, Day 1, 2014. "Who are the chosen?" the Katerina K. Whitley, Sermons that Work, Episcopal Digital Network, 2014. Propio 15 (A) – 2014 POR EL RVDO. Enrique Cadena, Sermones que Iluminan, Episcopal Digital Network, 2014. "Beautiful and Terrible Things," Frederick Buechner Sermon Illustrations. "Listening in Love," Dr. Jan Love, Day 1, 2008. Bible Study, Proper 15A, 2014, Christine Havens, Sermons that Work, Episcopal Digital Network. Estudio de la Biblia. Propio 15 (A), por Christine Havens, Sermones que Iluminan, Episcopal Digital Network, 2014. Worship Planning Helps (Pentecost +10): Worship & Preaching Notes, Hymn Suggestions and Worship Resources from the United Methodist Church General Board of Discipleship. Ministry Matters, August 17, 2014. Worship resources for Proper 16 by Beverly S. Bailey from SermonSuite. Mustard Seeds, "Getting Along," Proper 15, 2014. A lectionary-based ideas resource for leaders of contemporary worship, Ann Scull, Gippsland, Australia. Lectionary Liturgies, Ordinary 20, Thom M. Shuman, Presbyterian Church (U.S.A.), 2014. Worship Resources, August 14, 2014, Rev Mindi, Rev-o-lution. Liturgy for the Celebration of Life, Pentecost 9A. Liturgies from a Progressive/Post-Liberal Theology, Revd Rex A.E. Hunt, The Uniting Church of St James Curtin, ACT, 2011. Worship and Liturgy Resources, Ordinary 20, by Rev David Beswick, Uniting Church in Australia. Lector's Notes, OT 20, Gregory Warnusz, Saint Jerome Parish, Bellefontaine Neighbors, MO. Notes and commentary for those reading this week's lectionary texts to the congregation. "Liturgy: prayer reflection", reflections on the collect at the Eucharist, Rev. Bosco Peters, New Zealand. BCP. Roman Catholic. 21st Century Worship Resources, Pentecost +10, UMCDiscipleship.org. Offertory Prayers, Pentecost +10, UMCDiscipleship.org. The Timeless Psalms: Psalm 133, (Pentecost 9A), Joan Stott, prayers and meditations based on lectionary Psalms, 2011. Prayers of the People, Proper 15A, Fr. Jeremiah Williamson, Praying the Scriptures, 2011. "How Good, How Pleasant" A Sung Call to Worship for Psalm 133, for August 14, 2011, from Anna's Hosannas. Prayer for Proper 15, RevGalBlogPals, 2011. The Timeless Psalms: Psalm 133, Joan Stott, prayers and meditations based on lectionary Psalms, 2014. Evangelectionary for August 17, 2014, Jonathan Shively, Evangelism Connections, 2014. HermanoLeón Clipart, Ordinary 20, Free clipart, backgrounds, slides, etc. Clip Art, Ordinary 20, Fr. Richard Lonsdale, Resources for Catholic Educators. Clip Art Images: Matthew 15:21-28, Misioneros Del Sagrado Corazón en el Perú. Ordinary 20 at Cerezo Barredo's weekly gospel illustration. Follows Latin American Roman Catholic gospel reading, though most gospels texts/themes are found in the index. Liberation emphasis. "Teaching Jesus," Barbara Kay Lundblad, ON Scripture, 2011. Commentary and association with current news events, links and videos. Crumbs Louder, video by David Coleman and his children. The Painted Prayerbook, "The Feast Beneath," Jan Richardson, 2011. Use of images. "Tube of Toothpaste," video, John Stevens, Dollar Store Children's Sermons, 2014. "Dog's Dinner," video, J.M. Coleman and Family, YouTube, 2014. "Come Gather," Brenton Prigge, NewHymn. Hymns of the Spirit Three, Proper 15A, Richard E. Hurst, Universalist National Memorial Church. Psalm 133 set to Rest (86 886), Psalm 67 set to Vicar (11 10 11 10) by Dale A. Schoening, Metrical Psalms. Hymn and Song Suggestions, Proper 15A, 2014, annotated suggestions from Natalie Sims, Singing from the Lectionary. Lectionary Puzzles, Proper 15. Word search puzzles in RTF or plain text, by Reg McMillan, St.Stephen's Presbyterian Church, Peterborough, Ontario. Crumbs -- Children's sermon by B. Kathleen Fannin based on 15:(10-20) 21-28 from SermonSuite. Blessing of the Backpacks 2011, Proper 15A, Frances Woodruff, On the Chancel Steps. Faith Formation Journeys, Children's Sermon, Pentecost 9A, 2011.